An ever-accelerating racial wealth gap has Black families on track to see their median wealth hit zero in this lifetime, making it difficult or impossible to transfer wealth to the next generation, according to a new report. 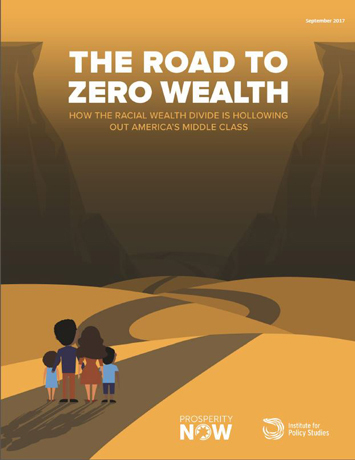 In “The Road to Zero Wealth: How the Racial Wealth Divide is Hollowing Out America’s Middle Class,” researchers looked at the median racial wealth divide over the next four and eight years, as well as to 2043. They excluded goods like cars, appliances and electronics. When researchers stripped those from calculations, they found a typical Black family has just $1,700 in owned wealth—1.3 percent of the wealth owned by a typical White family ($132,000). Latino families fare just barely, with their median wealth standing at only $2,000, according to researchers with the Institute for Policy Studies and Prosperity Now. While some falsely argue that the racial wealth divide stems from personal choices by individuals and communities, the facts tell a different story, the researchers said. “Case in point? White high school dropouts own more wealth than Black and Latino college graduates. … Furthermore, single-parent White households own more wealth than two-parent Black households,” wrote the authors. “Zero Wealth shows that low income Blacks, Whites, Latinos still have great differences in wealth, such as Blacks and Latinos making less than $18,500, have a median wealth of zero, while (low income) Whites have a median wealth of $3,000. “Now, $3,000 isn’t a lot of money, but it sure is in a different situation than those who have zero median wealth,” stated Dedrick Asante-Muhammad, senior fellow, Racial Wealth Divide at Prosperity Now and lead author of the report. The report was released Sept. 11. Authors looked at what it means to have middle-class wealth of $68,000 to about $200,000 based on strong, White middle-class households in the 1980s, and where wealth was so concentrated, according to Mr. Asante-Muhammad. Two-thirds of that median was about $100,000 and $68,000. Researchers doubled that wealth, then marked the percentage of Blacks and Latinos that did not hit that mark or higher, he explained. That amounted to 70 percent, which means the overwhelming majority of the two ethnic groups are wealth poor, according to Mr. Asante-Muhammad. Is Zero Wealth indicating that Blacks and Latinos are tagged to be part of a permanent underclass in America, given some key findings: White middle-income households (earning $37,201-$61,328 annually) own nearly eight times as much wealth ($86,100) as middle-income Black earners ($11,000) and ten times as much wealth as middle-income Latino earners ($8,600). Or if the middle class were to be defined by wealth rather than by income, Black and Latino families would need to earn 2-3 times as much as White families in order to enter the middle class? What about research showing that by 2024, median Black and Latino households are projected to own 60-80 percent less wealth than they did in 1983? “That is what is being shown, and I would even say you don’t have to wait until 2053, which is when we say the median wealth for Blacks will be zero … and 2073 for Latinos … but I would say already the fact that over 70 percent of African Americans and Latinos don’t have middle class wealth or higher is already showing a middle class (wealth) divide which will be permanent, unless things are turned around,” stated Mr. Asante-Muhammad. “I won’t declare them permanent for all time right now, but clearly, the title of the report, The Road to Zero Wealth could also be titled The Road to Permanent Underclass. And that is the road we’re on, and it’ll take radical action to change that,” he stated. 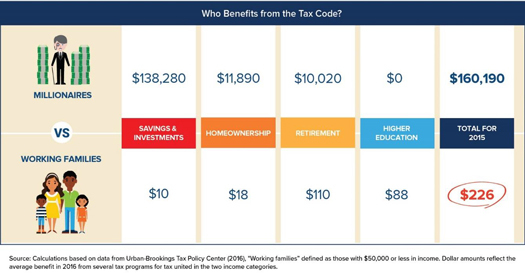 The report recommends changing the nation’s tax code to stop subsidizing the already-wealthy, investing in opportunities for low-wealth families to build wealth, protecting low-wealth families by strengthening the Consumer Financial Protection Bureau and closing nefarious offshore-tax shelters used as shields for assets of the ultra-wealthy, investing in children’s savings accounts, auto-enrollment in retirement accounts, federal jobs guarantees, and conducting a racial wealth divide audit of government policies to curb the problem. Otherwise, the situation for Blacks could remain reminiscent of Third World countries, Mr. Asante-Muhammad stated. “That’s absolutely due to one thing and that’s lack of unity,” said Ava Muhammad, national spokesperson for the Honorable Minister Louis Farrakhan. The dismal future facing Blacks results from their persistence in trying to assimilate into White society, rather than pooling their resources and going for self, she declared. What about land, which is part of the sum total of people’s resources, and necessary to have true economic wealth? asked the attorney, author, radio personality and Nation of Islam student minister. What about the value of human resources, such as appreciating all of the multi-billion industries in America that rely on Black talent to survive, starting with sports? Without Black talent, there would be no National Football League, which generates $14 billion a year in revenue and more than 70 percent of the players are Black, observed Min. Muhammad. Forbes Magazine’s 2017 list of 100 highest paid celebrities, which doesn’t deal with their net worth, and is only annually, is heavily populated with Black artists, athletes, and personalities, she noted. Sean Combs (P-Diddy) tops the list with $130 million last year. It includes Beyoncé ($105 million), Drake ($94 million), LeBron James ($86 million), and the Weeknd ($92 million). “The proportion or the ratio of Black people on that list exceeds our ratio to the population, and so we have wealth. We have wealth, but we’re not pooling our wealth, not only in the dollar amount of the $1 trillion in assets that we generate, which you have companies that are approaching that now, but the problem is lack of unity, lack of common or singular purpose,” Min. Muhammad stated. Best way up from zero? Mr. Asante-Muhammad encouraged individuals should start thinking in terms of wealth—not having $1 million, a mansion, or a car they can’t afford—but financial assets that can help take advantage of economic opportunities, or survive an economic downturn. “If you only have $500 in savings, how can you work to increase your wealth so that a year from now you have $800 or $1,000 in savings?” he asked. Another way to look at wealth is through resources, such as free job-training and free certification programs, not those that cause debt, but never increase income, he added. “Wealth building is not trying to get one deal done, and you think all of a sudden, you’re successful,” he said. “Back in the 1950s and 60s, we were beginning to acquire that capability of passing on intergenerational wealth, because in segregation we were forced to work together, and frankly, we didn’t have any problem being together,” said Min. Muhammad. Blacks wanted freedom to attain what they were capable of during the so-called civil rights struggle, not to have lunch or shop with Whites, because their Black communities were by design made desolate and deficient, she said. They were beginning to acquire middle-class status, were buying homes, and passing those on to our children as intergenerational wealth, Min. Muhammad noted. Now, so much of Black income (78 percent) goes to paying rent to somebody, she stated. At the root of home ownership are marriages, which have been broken up, and restoring that ability requires turning inward again, Min. Muhammad said. Chattel slavery, wage theft, federally sanctioned housing discrimination and racially-exclusive land redistribution are a few ways federal government policies built and preserved the racial wealth divide, the report noted. As for jobs, Min. Ava Muhammad echoed Min. Farrakhan’s sentiments, how can there be no jobs when there’s all this work to be done? It’s not that the federal government can’t do it, it’s that it won’t do it, because it’s been hijacked by multinational corporations, she said. “The United States infrastructure as we know is falling apart. There is enough work to be done to improve this country that there should be almost no unemployment, but there is a lack of will. They don’t even have jobs for their own people, as stated by the Honorable Elijah Muhammad,” Min. Muhammad noted. Dr. Boyce Watkins, founder of the Black Economic Empowerment Tour, attributed the problem to Black families creating employees versus owners and wealth builders in a capitalistic society. “Think about that first conversation that you hear a lot of families have with their kids when it comes to making money. What’s the first thing they say? You make sure you go get a job,” mimicked the writer, organizer, and academic. “While we might want to say well there are certain things that Black people are not allowed to do, I’ve been on this earth for 46 years and I ain’t never had a White man tell me I can’t start a business. I ain’t never had a White man tell me I can’t pick up a book and read to learn the skills that I need in order to do what I want to do,” Dr. Watkins told The Final Call. Mindset is huge, he continued, and basically, Blacks, like mosquitos in the bottom of a jar, don’t believe the ceiling is gone though the lid’s been removed. He cited three pillars of wealth building in America as ownership of stocks and bonds, real estate, and small businesses. People involved in those categories usually don’t have a problem when it comes to wealth regardless of their ethnicity, he argued. If opportunities are created for Black people, it will be by Black people, Dr. Watkins continued. Look past government solutions to community-based solutions, like making videos to help young Black men in the ’hood-to-build businesses, he said. Dr. Watkins thinks the report is a great effort and commends the authors for putting recommendations on the table. He also feels that 30 years ago, the same article could have been written, or 20 years ago. That’s because the U.S. hasn’t made much progress in terms of government policy in the last few decades, he said. Perhaps one day, if Black people become a little more politically alert and aware, they’ll demand that Democrats that beg for their votes actually enact some of the report recommendations, Dr. Watkins said. He’s not holding his breath. “I think that the easiest way for Black people to elevate is we must train the masses of us who want something better to be able to get access to something better. That’s why we’re building schools and all of that stuff. I ain’t waiting for these White folks. These White folks don’t care nothing about us, and they tell us that at every turn,” said Dr. Watkins.